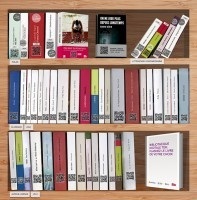 Rail travelers have a lot of time on their hands but they don't always have a good book to fill it, and that's why SNCF has launched a new digital library program. Passengers riding on the French state railway can now take advantage of a selection of free public domain ebooks. Developed in partnership with Storylab and Parallel Publishing, the bibliothèque digitale TER offers short reads which can take anywhere from 15, 30, 45 minutes, to 1 hour , perfect for short trips. The program also features full-length public domain novels, including free classics of French literature like La Fontaine's Fables, Emile Zola's Germinal, the Saturnine Poems by Paul Verlaine, and many others. In addition to the free works, readers can also buy ebooks, with prices starting under one euro. I have fewer details on that, so any first hand accounts would be appreciated. There's long been an emotional connection between books and the rail, leading a number of cities to equip their commuter stations as digital libraries. The idea is still uncommon, but cities as diverse as Philadelphia, Bucharest, and Mexico City have started programs which enabled riders to download ebooks as they pass through certain stations. According to Boersenblatt, this digital library grew out of SNCF's plans to equip all stations and express trains with Wifi. I would bet that it was also influenced by similar program which launched in Spain in 2012, or the program that Piper Verlag started in Germany in February of this year. The $69 Kindle is Out of Stock – Could This be a Sign of a New Model on the Way?